5 1/2 x 9 1/4 x 8 1/4 in. Four books by four different authors are stacked on top of each other and precariously cantilevered to one side. The books colorful hardbound covers are removed, revealing the unprotected spines and rendering the texts nameless and their separate discourses indistinct. The book pages have been hand cut in a wavelike motion with a knife, fragmenting the black and white text into long steps, like those on ancient Mayan temples. 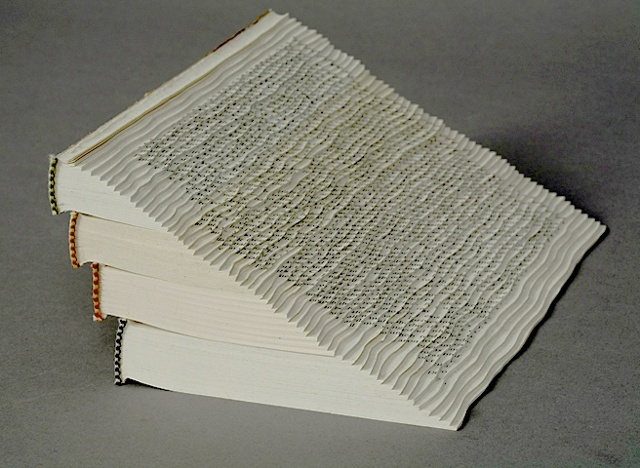 Viewed from atop, the piece appears to be contoured from one large book, but turning it to the side the viewer sees the four delicately balanced text blocks barely held in place by gravity. Thus, from one perspective, the piece represents the fluidity and unity of ideas; from the other perspective, the piece suggests four different authors locked in a debate, which at any point may devolve into chaosand for which any dialectical resolution is hard to achieve.